The MK 19 Machine Gun is air cooled, blowback operated (with advanced primer ignition), belt fed, and can mount on the ground or on a vehicle. a. TOP COVER ASSEMBLY (1). Hinged to the receiver at the forward end by two straight pins. Locks by a latch assembly attached to the rear left side of the cover. b. SECONDARY DRIVE LEVER (2). Consists of a lever and permanently installed retaining ring. The forked end of the lever connects to the inner feed slide pin. The slot-end engages the pivot post on the primary drive lever. The secondary drive lever's pivot post engages the hole in the top cover assembly. The retaining ring is attached to the pivot post. c. PRIMARY DRIVE LEVER (3). Located on the top of the vertical cam assembly. Features a large and small pivot post. The large post protrudes through the raised portion of the vertical cam assembly and through the receiver. The small pivot post engages the slot in the secondary drive lever. d. VERTICAL CAM ASSEMBLY (4). Extends down the receiver's long axis and passes through the center of the bolt. The raised portion attaches to the receiver and to the primary drive lever. e. BACKPLATE PIN ASSEMBLY (5). Consists of a steel pin with knurled head, and a permanently installed retaining ring. The backplate pin assembly secures the bolt and backplate assembly to the receiver. f. RECEIVER (6). The steel housing which supports all the other components. The ammunition-feed area of the receiver contains a primary and a secondary positioning pawl. The groove from the right-hand wall to the mouth of the feed area is called the "link guide". The grooved rails on the inside of the receiver support the bolt. g. CONTROL GRIP ASSEMBLY (7) (MK 19 MOD 3 ONLY). Attached to the backplate on the rear of the bolt and backplate assembly. Consists of two handgrips and a butterfly-type trigger located between the two grips. h. BACKPLATE ASSEMBLY (7) (UGWS ONLY). Attached to the backplate on the rear of the bolt and backplate assembly. i. BOLT AND BACKPLATE ASSEMBLY (8). Consists of a machined steel bolt attached to a backplate by a set of telescoping rods, tubes and recoil springs. 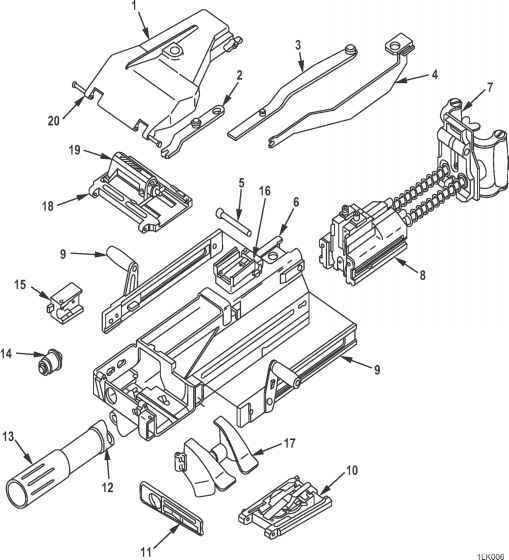 j. CHARGER ASSEMBLIES, LEFT-HAND AND RIGHT-HAND (9) (MK 19 MOD 3 ONLY). Each assembly consists of a charger housing to which is attached the arm with handle assembly and charger handle lock. The charger housings are installed on the sides of the receiver. k. CHARGER BLOCK (9) (UGWS ONLY). Block used for attaching the turret charging system. l. SEAR ASSEMBLY (10). Consists of the receiver sear and safety mechanism components inside a sear housing. The gun's safety is mounted on the rear of the assembly. m. ALIGNMENT GUIDE ASSEMBLY (11). Consists of the steel alignment guide and a flat spring held by a flat head screw and shoulder screw. The shoulder screw holds the alignment guide against the forward wall of the receiver's ammunition-feed area. The ogive plunger assembly protrudes through the elongated opening in the alignment guide. n. BARREL (12). The 40 mm grenade barrel screws into the receiver. The chromed bore is rifled to impart spin to the fired round. o. FLASH SUPPRESSOR (13). The threaded end of the flash suppressor screws onto the end of the barrel and is secured with a slotted spring pin. p. OGIVE PLUNGER ASSEMBLY (14). Protrudes through the forward wall of the ammunition-feed area of the receiver and is held in place by the alignment guide assembly. Consists of a housing, plunger, and compression spring. The rearward end of the assembly is contoured to cushion the ogive of the round. q. ROUND POSITIONING BLOCK (15). Consists of a block with machined pins and springs. The pins are mounted to key slots in the right-hand wall of the receiver's ammunition-feed area. r. REAR SIGHT ASSEMBLY (16). Hinged to the rear sight base hinge support on top of the receiver. The rear sight base is held by four socket head cap screws and is designed to hold the AN/TVS-5 Night Vision Sight. The M2 bracket interfaces between the rear sight and the AN/TVS-5 Night Vision Sight. The sight frame holds a scale labeled from 300 to 1,500 meters, an elevation mechanism, and a windage mechanism. s. FEED THROAT ASSEMBLY (17). Assists feeding of 40 mm ammunition. The feed throat attaches to the forward left side of the receiver by two sets of spring-loaded shoulder pins. Without a feed throat, machine gun stoppages may occur because of twisted or misaligned rounds. How do belt fed machine gun works? Which is mk19 primary secondary positioning pawls? How a belt fed weapon works? How does a belt fed rifle work? What is an O JIVE plunger on a MK 19? 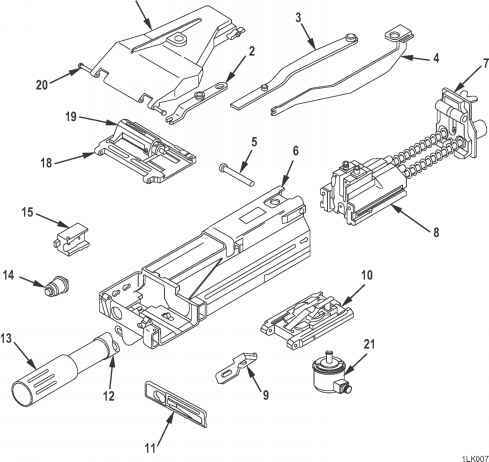 How work inside M240 gun? How an artillery elevation mechanism works?